Eschewing trips to the mall, Americans are paying off credit-card balances and home-equity lines. Despite low rates, mortgage demand has plummeted. Some people have no choice but to pare their debts (indeed, some are being foreclosed on). For others, call it morning-after sobriety or late-blooming prudence. Losing income tends to bring on a case of the nerves, and half of American workers have suffered a job loss or a cut in hours or wages over the past 30 months. And, need we add, people’s stock portfolios are not what they were. The economic term is “deleveraging”; it means that, as opposed to the normal state of affairs, in which, each quarter, people borrow more money and banks issue more loans, credit in the economy is shrinking. Remarkably, this deleveraging has been going on for nearly two years. To return to the status quo of before the housing boom — say, back to debt to income ratios prevailing in 2000 — it would take five more years of deleveraging at the current rate. Deleveraging cycles are rare, notes David Rosenberg, an economist with the Toronto firm Gluskin Sheff, but five to seven years is typically what they take. 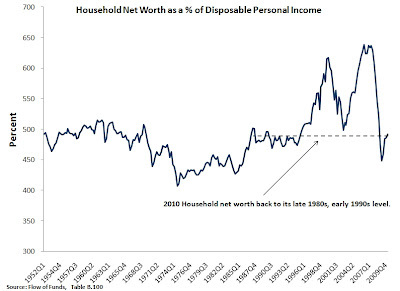 Household net worth is close to what it was in the late 1980s, early 1990s. 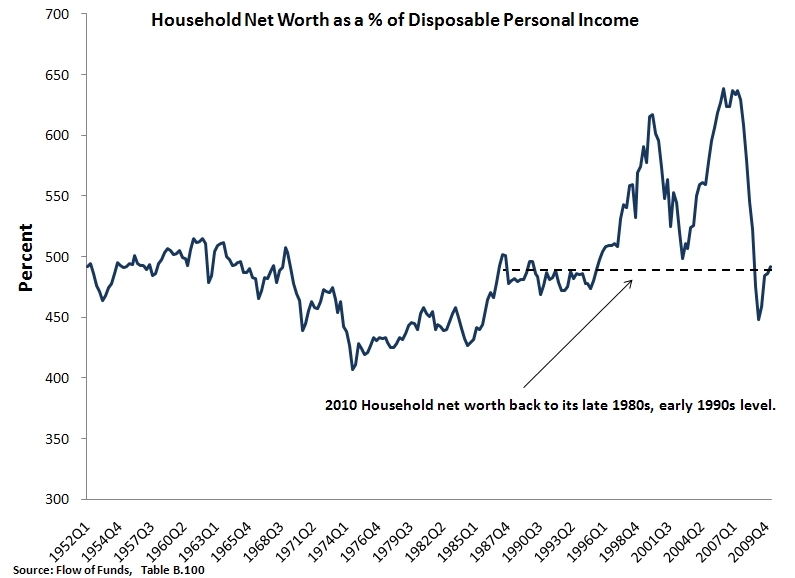 Obviously, most of the fall in household net worth has come from a decline in asset values. Liabilities have not change much. This is very evident in if one looks specifically at residential real-estate assets versus residential mortgage debt. Truly this is the revenge of the balance sheets. I don't think he's wrong. I just hope it's not a lot worse than he thinks. When the tax increases come next year,the velocity of money will slow even further. And there's an excellent chance for a whole new tsunami of mortgage defaults in the next 24 months or so. I'm not sure the picture Lowenstein paints of worried families paying down credit cards and foregoing vacations to "deleverage" is the reality of the situation, though. I think the deleveraging largely consists of banks lowering credit card limits, and dropping asset values making home equity credit a thing of the past. And no one buys a new car if they think they might be about to be laid off. Well, would you rather the consumer re-leverage? I would rather see the public sector deleverage a bit, frankly. Preferably on the spending side. Hi David, I'm a little surprised to see this admittedly popular perspective from you, but maybe I'm misunderstanding. So a few questions. You talk about net worth being back to the level of the early 80s as if there is some kind of expectation that HH net worth should perpetually increase as percentage of disposable income. Why should this be? Are you make a more subtle point about the relationship between demographics and saving? In 500 years, if HH net worth was the same ~500% of disposable income as it has averaged for the past sixty years, would you view that as a sign of economic stagnation (why?)? In 1949 HH net worth was 500% of DI. In 1994 it was 486%. Should that be considered as amazing or alarming? Second, let's say that for some reason we think that the historical average net worth/DI ratios are in fact suddenly considered "too low" -- perhaps because of demographics -- and the brief recent window of higher ratios now reflects people's desires for more savings relative to disposable income. Why is this some special, extended "balance sheet recession" problem that will take years to correct as opposed to just a standard monetary disequilibrium problem that would be fixed (cleared) with effective policy? Okay, people want to save more. So interest rates decline. If there is no risk preference, investment increases at the expense of consumption and presumably mpk declines and we go along our way at full capacity as the market clears the desire for increased savings. So the problem comes when people want better balance sheets (savings) but not risk, so they want to save but not invest, and so they start driving risk free rates down until they hit the nominal zero bound, money becomes a substitute and we have frustrated deflation or frustrated negative real risk free rates. Isn't this the usual problem -- and doesn't the usual prescription (reduce the return of risk free savings) apply if we can figure out how to create inflation expectations? What makes it special or inherently longer lasting as a "balance sheet recession?" Not just a balance sheet problem though is it? Surely there are problems in the real economy, as the Austrian school has pointed out - we have significant resource misallocations as a result of the conjunction of dreadful monetary policy and state intervention in the housing market. And then there are foundational problems along the lines of a dysfunctional education system turning out legions of young people with low productivity potential and regulatory capture corrupting the financial system. But dont worry says dlr, a bit of inflation and we'll be right!